What a cutie! I love that her one ear is bigger than the other. Looks like she is always saying "Eh? What's that you say?" 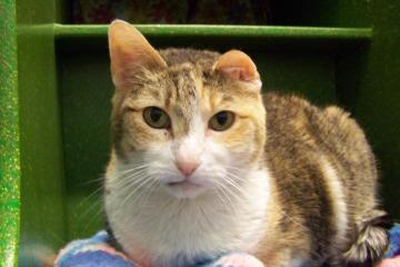 Ivy is a 7-year-old female cat who was brought to Lollypop Farm with nine other cats -- they had all been abandoned. She is a beautiful calico who was born with one ear a lot smaller than the other. Her hearing is just fine, though! She enjoys spending time with people, but she likes her alone time, too. Ivy likes other cats as well as dogs, but she can be nervous around children. She is eligible for our Seniors-for-Seniors program, so adopters age 60 and older can take her home free of charge!